Exuberant song and dance are interwoven with excerpts from speeches and numerous vignettes in this potted political and personal history of Nelson Mandela as a key force behind the eventual embrace of democratic elections in South Africa. 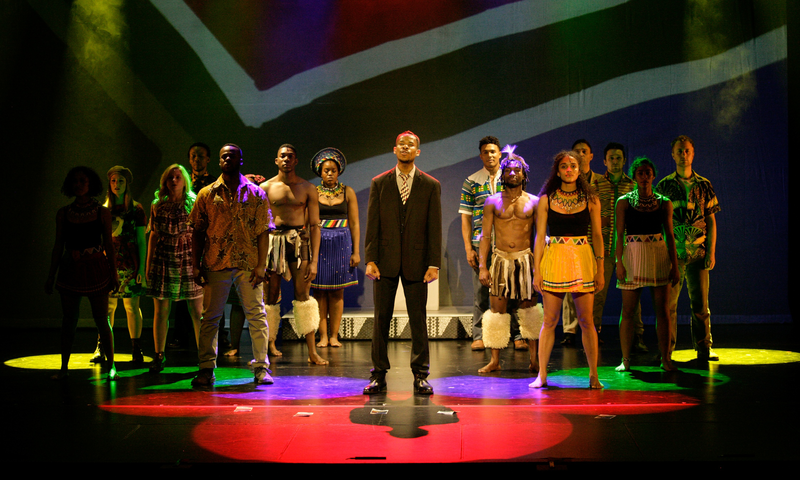 Although Madiba the Musical is heavy-handed in moralising about its worthy subject and his cause, Mandela’s story in trying to build national unity is one worth repeated telling as it highlights devotion to achieving a laudable end, especially given the private costs and what black South Africans had endured. If the price he paid has not resulted in the kind of lasting improvement he desired, it was still a fight needing to be fought. Directed by Pierre-Yves Duchesne, this show combines Australian and international talent to good effect. In the central role, Perci Moeketsi renders the distinct pulsing intonation of Nelson Mandela’s speaking voice in recognisable form, though clarity is sometimes sacrificed. His physical depiction is first rate. The athletic David Denis narrates, often employing rap (his alternate career). He also operates as Mandela’s conscience, urging to him take action. This is a curious device, especially given his eventually disclosed identity. Standout vocalists are Ruva Ngwenya (as Winnie Mandela) and Tarisai Vushe (Sandy Xulu), but they are highlights in a sea of strong voices. Blake Erickson, for instance, shows control and power when his opportunity to sing arises, and the harmonies are delightful. Perci Moeketsi stars as Nelson Mandela in Madiba the Musical. Musical styles vary: a courtroom scene is depicted as if in a gospel church; the Soweto song is a compelling piece leaning on African choral work; and one duet borrows from the American stage musical mould. This musical is driven by energetic dancing that wins the audience. The trio of live musicians (Paul White, Mark Costa and John Clarke) is very capable, especially when featured for percussion backing, and the whole cast demonstrates considerable skill. The set is minimalist and wanting, however. It relies on projections and a few roll-on plinths. While that provides space for the troupe, especially in the dance segments, it leaves an impression of emptiness much of the time. The story is fragmented and has holes in it (there’s nothing about Winnie’s later absence, for example), partly because it needs to be very selective and ultimately upbeat when dealing with a long period. It is a musical, after all, and the genre demands that. There is a simple approach to the performance in narrative terms, with much striking of heroic poses and a final accent on the positive to be expected, especially to deliver the feel-good finale. Audiences that admire song and dance foremost, and don’t mind some simple moralising, will be best pleased. Madiba the Musical: A Celebration of Nelson Mandela is at the Adelaide Entertainment Centre until January 20.